Free Printable Small Heart Templates. Free Printable Small Heart Templates that you can use for Valentine’s Day decoration or crafts. 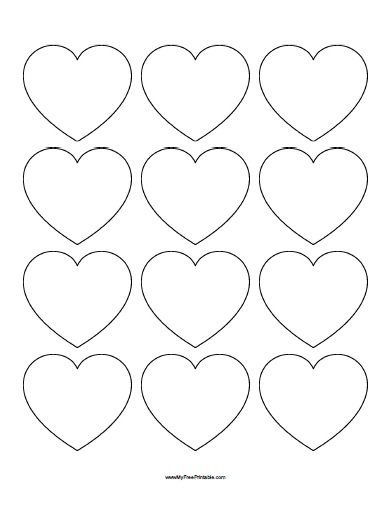 You can use this templates with small heart shapes to use as patterns for sewing, crafts for students, coloring, Valentine’s Day party decoration, cards, gift tags and more. Print it using your inkjet or laser printer and have fun making and decorating hearts at the classroom. You only need to print the 12 small hearts, cut them out with a scissors and use the small hearts template for the project you want to make. Click the link below to download or print the Small Heart Templates now in PDF format.